When I was younger I was convinced that Lucozade was the best drink going. I used to buy the little bottles all the time (45p each) and ignored all the colas and lemonades. As I grew up and went to university the number of energy drinks exploded and I drank most of them, admittedly now as mixers - we used to take our own Red Bull to the bars in 1997 before they started to sell it there. With all the taurine and crazy stuff that gets put into energy drinks these days (yes Mana Potion - I'm looking at you) it's kind of refreshing to go back to where it all started. Lucozade is essentially fizzy glucose water instead of the fizzy sugar water of the colas. The fact that you have to put more glucose in instead of regular sugar (sucrose?) means that it was marketed towards the health market and got bought for both sick people and athletes. These days the athletes have non-carbonated Lucozade Sport so that they don't have to burp their way to victory, so I guess that making good old Lucozade more exciting with new flavours is a good move. I remember the horrible barley versions and an odd orange based version but I don't think I've seen big bottles of cherry before and after my adventures into cherry dark chocolate I thought it was worth a shot. Oddly the first thing I noticed was that it's not really an energy drink flavour. 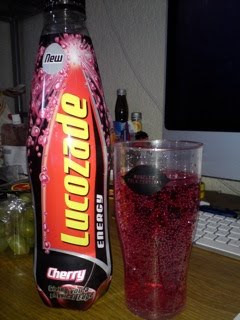 It's sweet, but it's also quite smooth, the cherry tastes like cherry sweets but not in a sickening way. As you can see from the (Mosely Folk Festival) pint glass the bubbles are present but it's not over fizzy like the original version. I often used to shake the bottle a bit on that just to lessen the gaseousness. I'm actually surprised by how drinkable this is and as it's presumably lower in caffeine than colas it's probably less likely to keep you awake at night, provided you have some way to burn off the extra calories. I'd be happy to buy this again, and I think it's actually quite presentable in it's black & red bottle and if they redid the logo in those colours too it may even be acceptable to have out with the other soft drinks at a party. ooh i cant imagine what cherry lucozade would be like, i rememebr i always used to drink it when i was ill and couldnt eat anythnig, love the orange one. Interesting side-note on the Orange Lucozade story: I used to work the bar in a venue for hire in Manchester which occasionally put on rather dodgy nights populated by Manchester's seedy underbelly. These rather expensively dressed but terrifying lot used to ask for Lucozade- but ONLY the orange one would do. If they couldn't get orange Lucozade, which we only rarely got in stock- they would go without.